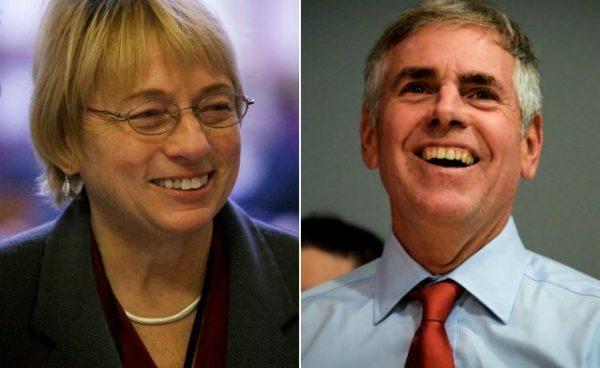 Janet Mills (left) and Shawn Moody are both front-runners in the Democratic and Republican gubernatorial races, respectively, according to a recent poll. Good morning from Augusta. A newly released poll provides good news for Democrats in Maine’s 2018 elections, showing Attorney General Janet Mills ahead of Republican Shawn Moody in the governor’s race and a tied contest in Maine’s 2nd Congressional District. It came from Pan Atlantic Research, a Portland firm that has a solid track record in Maine races with a slight historic tilt toward Democrats, according to FiveThirtyEight. Because the survey was finished two weeks ago, it only gives us a delayed look at the landscape. However, it buttresses the trends that we’ve observed in other polls. The governor’s race seems to have turned in Mills’ direction by the start of October, while U.S. Rep. Bruce Poliquin and Assistant Maine House Majority Leader Jared Golden are running a tight race. No surprises are seen looming for the other two incumbents in Maine congressional races. Mills was up nearly 9 percentage points on Moody — the third straight poll showing a similar margin — with the two independents in the single digits. The Democratic nominee got 40.4 percent support of the 500 likely voters surveyed by Pan Atlantic plus 4 percent more who said they’re leaning toward her — equaling 44.4 percent support to Moody’s 35.9 percent. Mills led Moody behind an edge in both of Maine’s congressional districts and a 21-percentage point advantage on the Republican among women. The margin between Mills and Moody was similar to two polls mostly taken in late September — one by State Treasurer Terry Hayes’ campaign. The independents — Hayes and consultant Alan Caron — were at 7.9 percent and at 2.3 percent, respectively. Taken together, their tallies haven’t moved much since the first public poll of the race in August, which showed Mills and Moody tied. Results like this will lead to increased pressure on Hayes and Caron to leave the race from Democrats who fear that they could act as spoilers for Mills in a contest that isn’t using ranked-choice voting. Caron said in a Portland Press Herald OpEd last year that he would bow out if polls showed by mid-October that he couldn’t win. We’re getting close to that self-imposed deadline now, but there hasn’t been a mid-October poll of the race yet. Independent Eliot Cutler polled as low as 11 percent in early October before surging to nearly beat Gov. Paul LePage in 2010 as support fell from Democrat Libby Mitchell. Hayes’ campaign has been trying to cast Moody as Mitchell 2.0, with her campaign saying on Monday that the Republican “does not have a path to victory in this election” and that conservatives can join a broader coalition to elect Hayes over Mills. But it doesn’t look like Republicans are likely to stray from their nominee. Moody strategist Brent Littlefield said the poll doesn’t reflect internal poll numbers, though the campaign hasn’t released them. This was the second recent survey showing Poliquin and Golden tied. Poliquin, a Republican, and Golden, a Democrat, were virtually tied in the Pan Atlantic survey of 251 likely voters in the 2nd District. The incumbent got 37 percent of support to the challenger’s 36.5 percent. Another 9 percent were backing one of the two independents — Tiffany Bond and Will Hoar — with 17.5 percent remaining undecided in the race. This poll was taken before another one from Siena College and The New York Times last week that showed Poliquin and Golden tied at 41 percent in a more robust survey that used 500 likely voters. However, the trends show that this could well be Maine’s closest top-tier race. The other two incumbents in Maine’s congressional races look safe so far. U.S. Sen. Angus King, an independent who caucuses with Democrats, got 57 percent of support in the Pan Atlantic poll to Republican state Sen. Eric Brakey’s 29.6 percent and Democrat Zak Ringelstein’s 8.2 percent with just 5 percent undecided. Brakey has released recent figures from an internal poll and Maine firm Critical Insights that show King below a majority, but it looks unlikely that the Republican challenger can unseat the one-term senator especially given ranked-choice voting. King also had a favorability rating of 64 percent in the Pan Atlantic poll — the highest of any member of Congress from Maine. U.S. Rep. Chellie Pingree, a Democrat from Maine’s 1st District, had 53.4 percent support to Republican Mark Holbrook‘s 29.4 percent and independent state Rep. Marty Grohman‘s 10.5 percent, casting doubt on the latter candidate’s bid to ride ranked-choice voting to the upset. The debate season in Maine for U.S. Senate candidates is finally underway. The three candidates for the seat that King won in 2012 debated for the first time Monday morning at the WGAN radio studio in Portland. As they have during campaign events, Ringelstein and Brakey attacked King from opposite ends of the political spectrum. At one point about 40 minutes into the discussion, moderator Matt Gagnon asked Ringelstein if he wanted to launch another attack on King. He declined, offering a respite from an otherwise non-stop series of slaps at the incumbent. Ringelstein, who has been endorsed by the Democratic Socialists of America, continued his assault from the left, trying to paint the incumbent as a pawn for special interests because King has accepted campaign contributions from corporate interests and voted for some of President Donald Trump’s nominees, including Secretary of State Mike Pompeo. Brakey worked to cement his conservative bona fides, blasting King for opposing some Trump nominees and initiatives. Other than correcting what he described as factual errors from his opponents, King largely refused to engage with them. Instead, his responses took on more the tenor of policy statements and a primer on Senate process. Questions during Monday’s one-hour forum hit on immigration, foreign policy, Supreme Court Justice Brett Kavanaugh and the tax cuts enacted late last year. Each candidate reinforced previously stated positions, offering little in terms of new positions. Public polling on the race shows that King, who holds a massive fundraising advantage, leads Brakey by double digits, with Ringelstein far behind. The race will be decided by ranked-choice voting, which means that if no candidate receives more than 50 percent of the vote in the first ballot count, the one who received the fewest votes would be eliminated and a second tally would be done. — A Republican lawmaker who might be interested in a leadership post brushed off Democrats’ call for him to give up his re-election bid because he has a criminal record. Rep. Jeff Pierce of Dresden said he was a “stupid kid” when he was arrested and pleaded guilty to felony drug charges and other counts during the 1980s. Democrats on Friday issued a release asking him and three other Republicans to abandon their campaigns because of past criminal charges. Pierce said he would pray for the Democratic party operatives who publicized his past crimes. Two of the other three Republicans mentioned in the release had already stopped campaigning. The fourth, Winter Harbor fisherman Billy Bob Faulkingham, who was convicted of misdemeanor offenses, including assault, criminal mischief and driving under the influence between 2000 and 2009, is running for a House seat against Winter Harbor Selectwoman Kylie Bragdon, a Democrat. — A familiar name is on the municipal ballot in a Katahdin region town. Former U.S. Rep. Mike Michaud, a Democrat who represented Maine’s 2nd Congressional District for 12 years before giving up the seat for an unsuccessful bid to unseat Republican Gov. Paul LePage in 2014, is running for a three-year term on the East Millinocket Board of Selectmen. Michaud, who had a long tenure in the Maine Legislature before winning the 2nd District seat in 2002, is running against a political newcomer, Tom McDunnah. — A Maine man is participating in a new treatment regimen that offers hope for cancer patients who have not had success with conventional care options. Westbrook resident Rob Leighton, who has colon cancer, was “pretty much running out of options” when he agreed to take part in the Maine Cancer Genome Initiative, which is spearheaded two years ago by The Jackson Laboratory and supported by a more than $8 million donation from the Harold Alfond Foundation. He is one of more than 300 Maine patients who are participating in the initiative, which aims to analyze the makeup of cancers cells specific to his body as a way of pinpointing the unique combination of genetic mutations in his tumors so they could then attempt to exploit them to kill his cancer cells. — A shuttered bowling alley where Maine’s junior U.S. senator once celebrated his birthday with a cake that originally read “Happy birthday, Susie,” has been spared. The Bowling Bowl, a Brunswick fixture for 80 years, will reopen later this year as Bolos, with new owners and a Tex-Mex menu. King, who said they got a deal on the cake so they just replaced Susie’s name with “Angus,” has bowled there for 30 years, as a league member and then substitute after being elected to the Senate interfered with his bowling schedule by keeping him in Washington, D.C.
You don’t get to be an award-winning Maine banjournalist without getting messy. The BDN’s Troy R. Bennett proves that once again with his latest video on how to make your Halloween pumpkin barf. He shares the not-so-secret formula, but if chemistry is not your thing, we could suggest a few common State House activities — anyone up for a six-hour legislative hearing? — that might engender the same response. Note to pumpkins: Don’t mention this activity in your high school yearbook unless you have a solid way to explain it at your confirmation hearing.